Tarot for Change: For tarot newbies - do you need to believe in tarot? For tarot newbies - do you need to believe in tarot? The theme of this blog is to advocate life change with the help of tarot and it is meant for people with or without experience in tarot - from fluent users to complete beginners. This particular post is for you, if you don't have much experience, but are curious but hesitant to start learning and using tarot. Firstly, to explain this blog's theme, I'm not saying everyone needs a life change - you might be completely content where you're at and that's great! Again, not everyone who wants a life change needs tarot. My point is that if you are unhappy with something, the only person who can take action is you. And if you're struggling with identifying a) what exactly is wrong with your life; b) what to do about it; and c) what could follow from implementing change, that's where tarot can step in very successfully. I personally believe that tarot is a mechanism we don't yet fully understand and it has a capability to dig out information about very personal or subconscious matters, even matters that have not yet happened. Yes, the future. Interestingly, many scientist now say that time does not flow forward, but it's an illusion of the mind: everything that ever was and will be - - - exists simultaneously. So glimpsing to future is not impossible, it's just not easy because we don't know how to do it - other than with "divination" methods such as tarot, possibly! In practice, tarot is a framework that helps its user to organise one's thoughts. It's like meditation or mindfulness made visible and tangible; the building blocks of cards showing what should/could be in the spotlight of your focus. Each card represents a concept in life: an event, situation, emotion, action, behaviour or a state of mind. When you draw cards - or a reader draws cards for you - they show a certain selection of these stereotypical concepts, such as satisfaction, team work, family, feeling content, heartbreak, feeling betrayed, feeling bored, feeling confident and so forth. Tarot cards can be interpreted by 78 to the power of x so your specific feelings will be found in the cards too. A skilled reader is able to see a story in these pictures and can tell what you should pay attention to - and potentially change. But the final word rests with the querent, the person who is receiving the reading; you'll know whether or not the advice resonates. Based on my own experience with talented readers, more often than not the interpretation fits 95-100%. People have always sought direction, guidance and answers to the burning and not-so-burning questions in life. It's part of human nature to be curious and keen to prepare for the future. Tarot is one method among many and it's easy to try out and even learn with a bit of patience and open mind. This year is nearing it's end and a new one is about to begin. Now is the perfect time to set goals and map for what you could change, release or achieve during 2016. If 2015 was a success, next year you can build on that. If it wasn't, 2016 can be, if you know what the direction could be. The "puzzle piece" meditation of tarot can help you immensely! 9 Pentacles, the card of prosperity, affluence, confidence, independence, growth - all great wishes for the year 2016! 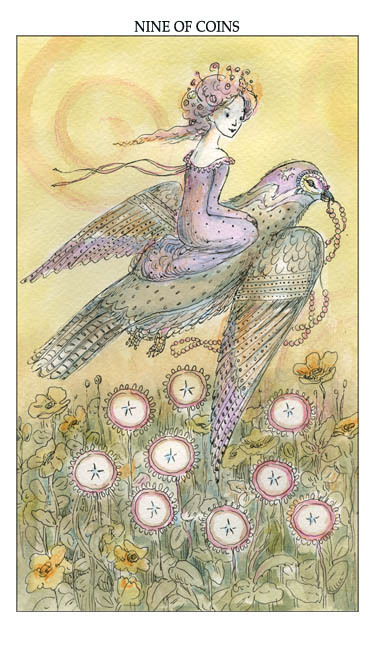 (c) Paulina Cassidy / Joie de Vivre tarot, published under permission.